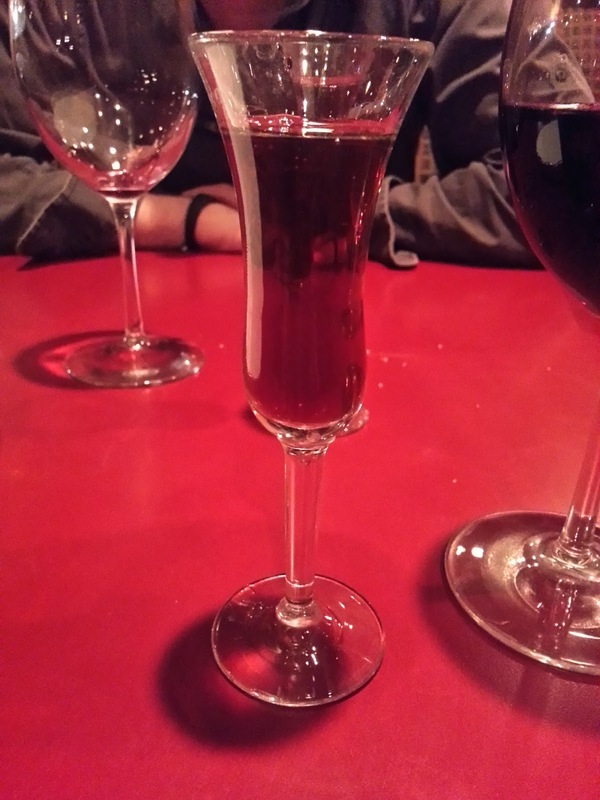 My husband and I have been going to Taverna Italian Restaurant for a number of years now. It should be obvious with my other posts that we love to eat out (in addition to cooking) and are loyal to restaurants that are consistent in serving quality food and service. Taverna is one such restaurant we often eat at. Taverna Italian Restaurant is located in the heart of downtown Saskatoon on 21st St E. If I had one criticism of this place it would be that it could use a new color scheme as the decor is very reminiscent of the time period they opened (est. 1969). Mirrors line the walls and the color scheme is a mix of soft pink/peach walls with brown tones from the wood structures. As dining is an entire experience, they could use a minor face lift to match the quality of food they provide. Plates and cups are a bit dated as well but for some reason this suits the place as it does a good job in presenting the food. I'm surprised this restaurant does not have a website since it's been around for so long and only joined Facebook back in June 2011. While the trend these days is to be online and social, I would think it alienates the few that are not on Facebook (and yes I do know a few people that do not use Facebook at all). Also when I first looked them up in Facebook I was confused by their cover photo as it wasn't a factual picture of how the restaurant looks like presently but upon further investigation it was understood their exterior is undergoing a face lift soon so that made sense. With respect to their Facebook page, they do an excellent job of advertising the daily features as well as provide informative facts about authentic Italian cooking. The service at Taverna has always been good. Upon entering we are always greeted right away and service throughout the night has been attentive. They are more than willing to explain any menu item to you should you have any questions as many Italian words are used throughout the menu. The menu is divided into sections: antipasto, minestre e insalate, piatti di pasta, specialita italiane, pizza, panini, and gelati e dolci with the appropriate number of items within each category so you don't feel overwhelmed looking at it. The menu uses a lot of Italian terms but the description is detailed enough to understand what you are ordering. They also provide a feature menu outside of the regular menu that changes every so often. At times they have feature pizzas which are a bit confusing as it is often a different size and pricing compared to their regular pizzas. Taverna Italian Restaurant has stepped up their game in recent years using Caputo flour in their pizza dough. Caputo flour is the best flour to make pizza dough out of as it is finely ground and has a lower gluten content making the dough less elasticity. Their pastas are also packed full of flavor using fresh ingredients. 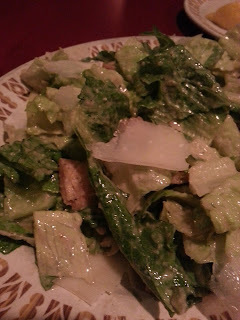 During our last visit there, we started off with their Ceasar salad containing a light oil based dressing with a hint of anchovies. I am a big fan of Ceasar salads using an oil based dressing versus the heavier creamy dressing other restaurants use that tastes out of a bottle. On other occasions we've had their baby arugula salad that we've become quite addicted to. The flavor of this salad is mix of balsamic vinegar mixed with finely diced shallots and a hint of lemon topped with fresh Parmesan. We were also served fresh bread with an oil and balsamic dipping sauce which we liked. For our main course, I had one of their feature pasta, Fettuccine Al Tarufo Nero - fresh garlic, asiago cheese, parmiginao-reggiano cream and fresh black Norcia truffles. It was by far the best pasta I've had in a while. 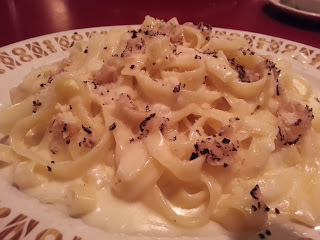 The pasta was cooked to perfection and the sauce was creamy goodness where the flavor of truffles was definitely present. The amount of sauce used was the right amount as well and the pasta was topped with bits of truffles. I would definitely have this again and just thinking about it makes my mouth water. 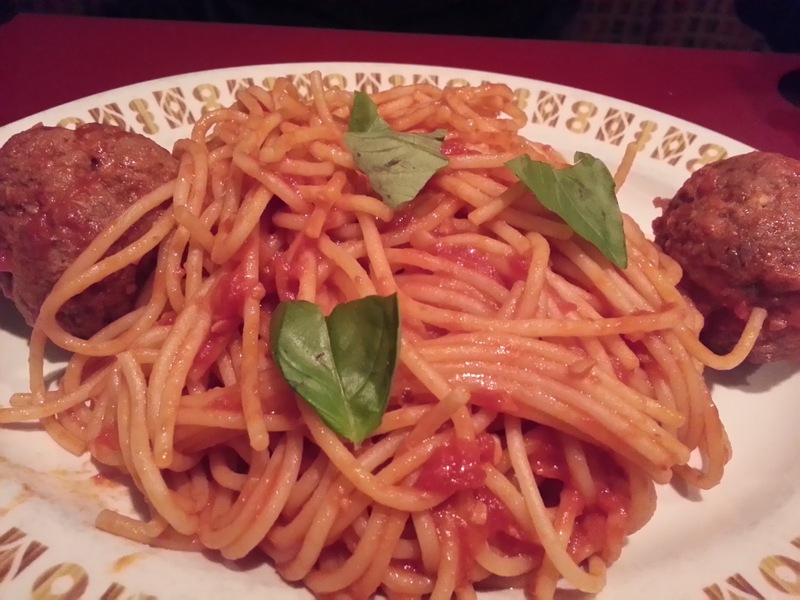 My husband had the spaghetti and meatballs which he claimed was quite delicious. He said it was probably the best he's had. The amount of food we were served was definitely ample enough that we didn't have room for desert. 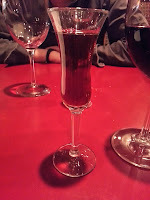 However we were served a complimentary alcoholic shot which I believe is new to their service and was a nice way to end our meal. The price of the meals is quite reasonable considering the quality of ingredients they use. It is not extravagant by any means with regular pastas ranging from $13-$17 and main courses at $25. They have a wide selection of wines that range in what I would consider reasonable prices. Taverna Italian Restaurant is by far my favorite place to go for Italian food. The ingredients they use are fresh and well balanced. We've never had a bad experience here and will definitely be back. Excellent read, I just now passed this onto a colleague who has been carrying out a little research on that. Anf the husband actually bought me lunch because I stumbled upon it for him smile So ok , i’ll rephrase that: Thank you for lunch! Thanks for the comment and glad I could help :) What kind of research is your colleague doing?